Arrive at Kochi. You will be picked up from the Airport/Railway station and will be transferred to the hotel. Rest of the day is at leisure. Overnight stay at the hotel. In the morning go for sightseeing of Kochi visiting the Dutch palace, Jewish synagogue, St Francis church and the Chinese fishing nets. Evening is at leisure. Overnight at the hotel. After breakfast, half day is at leisure. In the afternoon visit the Periyar wildlife sanctuary. Enjoy the boat ride. Overnight at the hotel. In the morning depart to Alleppey (150 kms/ 5 hours approx). Upon arrival check in at the hotel; overnight stay the hotel. Full day is at leisure. Enjoy the facilities offered by the hotel; overnight at the hotel. Check in at the houseboat at 12 00 noon and proceed to Kumarakom for a cruise; overnight stay at the houseboat. After breakfast, proceed to Varkala, a small town 55km north of Thiruvananthapuram. The whole day is for your leisure. Enjoy the golden sandy beach or experience an ayurvedic massage (optional). Overnight stay at hotel. Check out at 12 00 noon and depart to Kanyakumari (approx 150 kms/4 hours). Upon arrival check in at the hotel; overnight stay at the hotel. After breakfast in Kanyakaumari you may visit Vivekanand memorial,Triveni Sangam(confluenece of Arabian sea,Indian Ocenan&the bay of Bengal)&the famous Kanyakumari Temple. 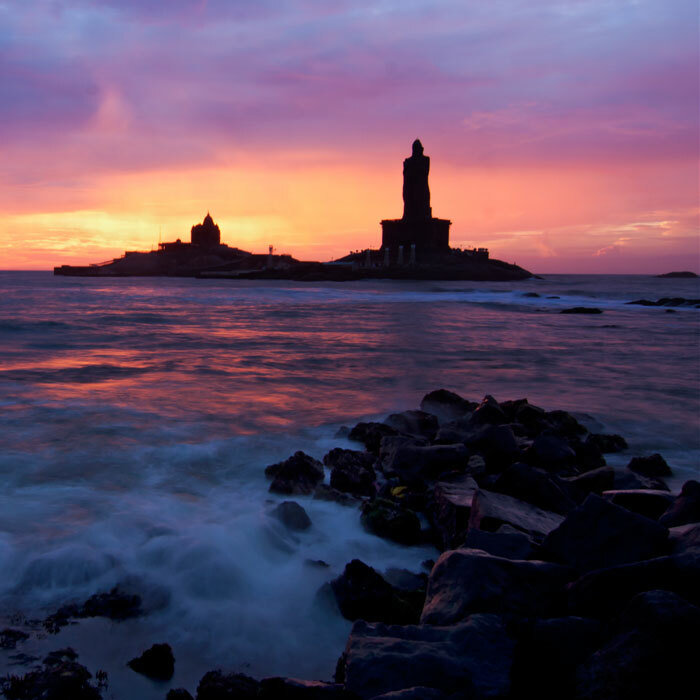 In the evening witness the spectacular sunset at Kanyakumari. Overnight stay at the hotel. Check out at 12 noon and proceed to Kovalam,on the way visit Padmanabhapurama Palace and Sudindra Temple,check in at the resort in Kovalam,overnight stay at the hotel/resort. After breakfast, full day is at leisure. Enjoy the facilities offered by the hotel; overnight at the hotel. Today you will be dropped off at Trivandrum Railway station for your journey to Goa by train. Overnight in the train. On your arrival at Madgaon(Goa) railway station, you will be picked up and transferred to the hotel. Known for its golden beaches, Goa is the ideal place to relax after any tour of India. Its sandy beaches, aquamarine waters and gently swaying palm trees provide the most salubrious tonic for the body and the soul. Overnight at the hotel in Goa. Today you will explore the North & South Goa. In the evening we have for you the Fishing village: which are part of Goa’s rich cultural heritage. Local Goan fishing village is created on the grounds of the hotel forming a perfect backdrop for a charming evening in a very rustic atmosphere. Artisans display their skills whilst the village dancers whirl to the music of a local band. Over night stay at hotel. In the morning you will be transferred to the Airport/Railway station for your onward journey.